Now fifty years after my first brochure on the subject, I present the scholars my latest book entitled Theory and practice of Muslim State in India. Its raison d’etre is that in my earlier endeavours, no attempt had been made to trace the relationships between the injunctions contained in Islamic religious literature and the attitudes and actions of Muslim kings and conquerors. 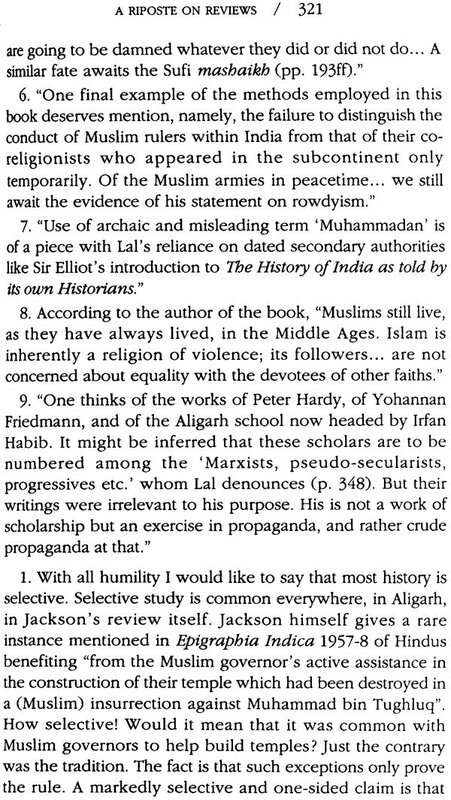 Ordinarily, historians writing on medieval Indian history refer to Muslim chronicles and histories as their only sources materials. The study of Islamic scriptural literature like the Quran, the Hadis, the Sunnah of the Prophet and the Shariat is ignored in historical studies as it is considered to belong to the domain of religion rather than to that of history. However, the study of this literature reveals that Muslim invaders and rulers were not cruel or fanatical by themselves as such, but they became so buy they became so by pursuing the malevolent ideology as projected in the Quran and the Hadis against non-Muslims. 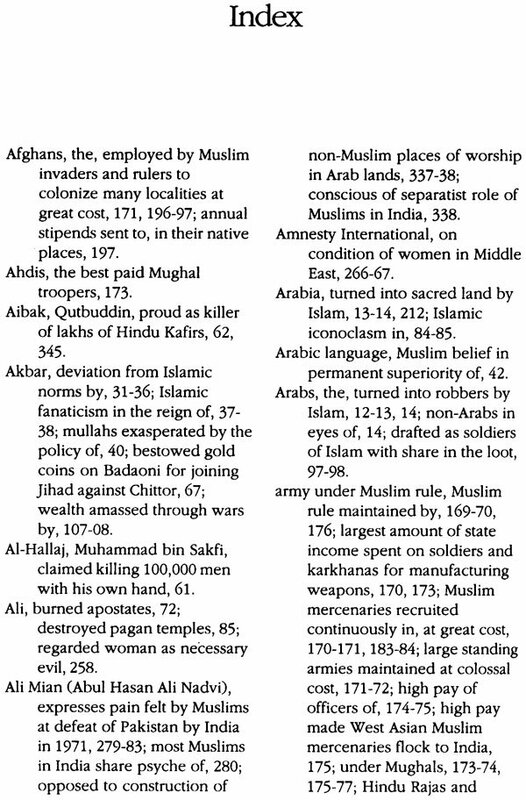 Muslim invaders and rulers of India belonged to different races and different countries. They belonged to different sects. Their rule extended for about a thousand years in various parts of the country. Their chronicles are written in different languages. But their behaviour follows a uniform pattern. Even those rules and nobles who had converted to Islam from Hinduism, considered their bloody acts against Hindus as acts of righteousness. The source of this uniformity of action is the Quran, the Hadis and the Sunnah which they quote with pride. These scriptures do not belongs only to the past. They are in operation even now. Pious Muslims in all places and at all times seek or provoke Jihad with an appeal to Islamic Scriptures. Regular wars, terrorist activities, and communal riots (Indian) are all called and fought in t he spirit of Jihad. Professor Kishori Saran Lal (b.1920) took his doctorate in Medieval Indian History from the University of Allahabad in 1945. Starting as a lecturer in the same University, he served in Madhya Pradesh Education service from 1945 to 1963 and taught at Government Colleges in Nagpur, Jabalpur and Bhopal. He was Reader in the University of Delhi for ten years(1963-73) and, for the next ten years, Professor and Head of the Department of History in the University of Jodhpur (1973-79) and the University of Hyderabad (1979-83). He has participated in many seminars and conferences, national and international, in India and abroad. In Madhya Pradesh, he was Secretary of the Madhya Pradesh Itihasa Parishad and Convener of the Regional Records Survey Committee. He Presided over the Medieval History Section of the History Congress in 1958, Punjab History Congress in 1975, Rajasthan History Congress in 1978, and Indian History and Culture Society in 1984.In 1977 he chained a Session at the Seventh International Conference of the Association of Historians of Asia, held in Bangkok. In 1973, the International Biographical Centre, Cambridge, U.K. commended Professor Lal as Men of Achievement 1973 and sent a diploma for his Achievement 1973 and sent a diploma for his distinguished achievements. The American Biographical achievements. The American Biographical Institute, Raleigh, North Carolina, nominated him for the prestigious title of Man of the Year, 1995. In 1999 the International Biographical Centre, Cambridge, U.K. awarded him the title of the International Man of the Millennium. 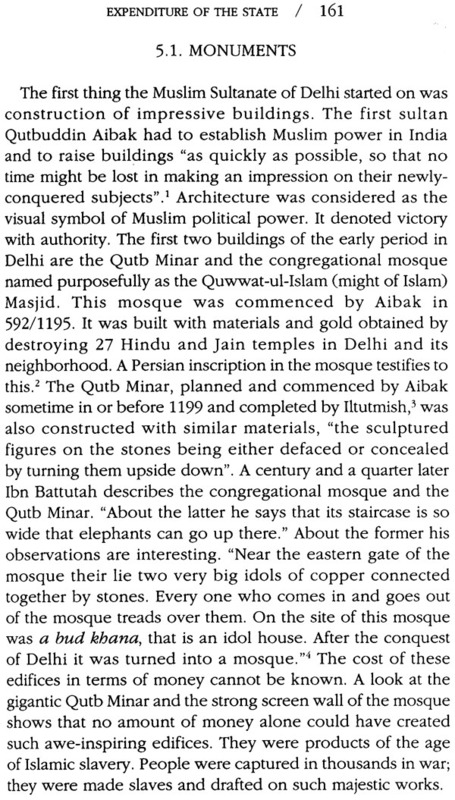 My first article, "The Spirit of Muslim Government in India", was published in the Annual Bulletin of the Nagpur University Historical Society, No. 2, October 1947. It was revised and published under the title Muslim State in India by Vichar Prakashan, Allahabad, in 1950 in the form of a small book. 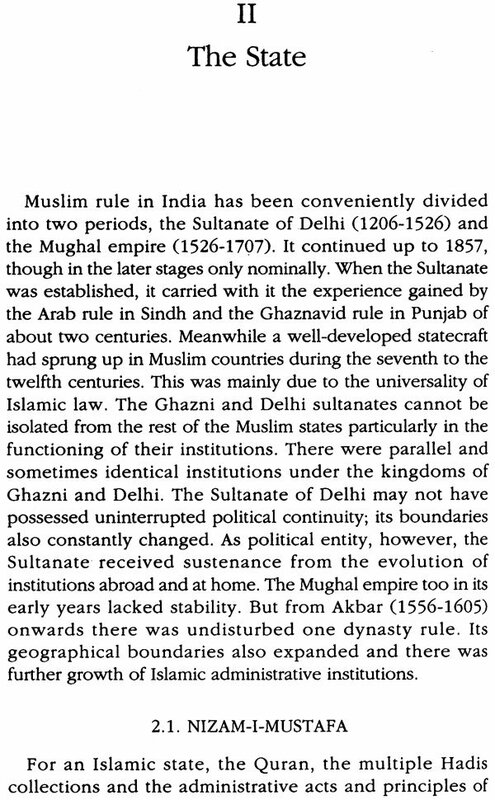 Chapters on Muslim administration and government are also included in my History of the Khaljis (1950), Twilight of the Sultanate (1963), Studies in Medieval Indian History (1966), Early Muslims in India (1984), and The Legacy of Muslim Rule in India (1992). Now fifty years after my first brochure on the subject, I present before the scholars my latest book entitled The Theory and Practice of Muslim State in India. Its raison d'etre is that in my earlier endeavours, no attempt had been made to trace the relationship between the injunctions contained in Islamic religious literature and the attitudes and actions of Muslim kings and conquerors. Ordinarily, historians writing on medieval Indian history refer to Muslim chronicles and histories as their only source materials. The study of Islamic scriptural literature like the Quran, the Hadis, the Biographies of the Prophet and the Shariat is ignored in historical studies as it is considered to belong to the domain of religion rather than to that of history. However, the study of this literature reveals that Muslim invaders and rulers were not cruel or fanatical by themselves as such, but they became so by pursuing the malevolent ideology as projected in the Quran and the Hadis against the non-Muslims, That is why the study of the 'moral and spiritual' literature of Islam becomes so important for the study of its history also. 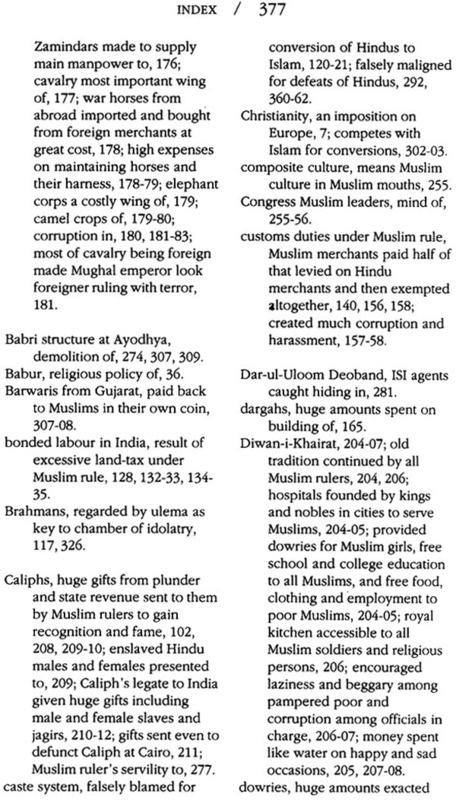 Muslim invaders and rulers of India belonged to different races and different countries. 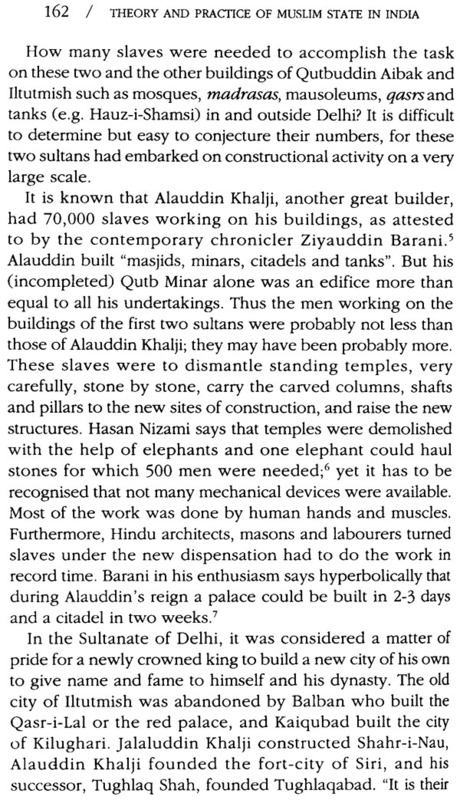 There were Arabs, Turks, Uzbegs, Pathans, Africans, Persians and what are called the Mughals. They belonged to different sects like the Shias, Sunnis, Wahabis, etc. Their rule extended for about a thousand years from the eighth to the eighteenth century in various parts of the country. Their chronicles are written in different languages like Arabic, Persian and Turki. But their behaviour follows a uniform pattern. Even those rulers and nobles who had converted to Islam from Hinduism, behaved with their erstwhile co-religionists like any Afghan or Turk or Mughal. 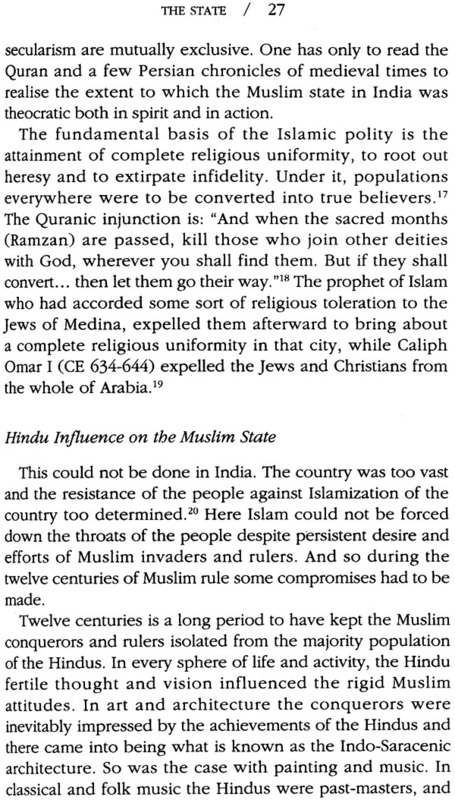 They considered their bloody acts against Hindus or non-Muslims as acts of righteousness. The source of this uniformity of action is the Quran, the Hadis and the Sunnah which they quote with pride. That is why the theory part of the Muslim state in India assumes so much importance. These scriptures do not belong only to the past. They are in operation even now. Hate words like Jihad, Kafir, and Mushrik are as current today as when they were first used about fourteen hundred years ago. Pious Muslims in long robes and pious Muslims in European dress (western dress does not make one modern in thought), in all places and at all times seek or provoke Jihad with an appeal to the Quran. Regular wars (Arab-Israel, Iraq-Iran, Afghanistan), terrorist activities (India, Algeria, Egypt, even America), and communal riots (India) are all called and fought in the spirit of Jihad. 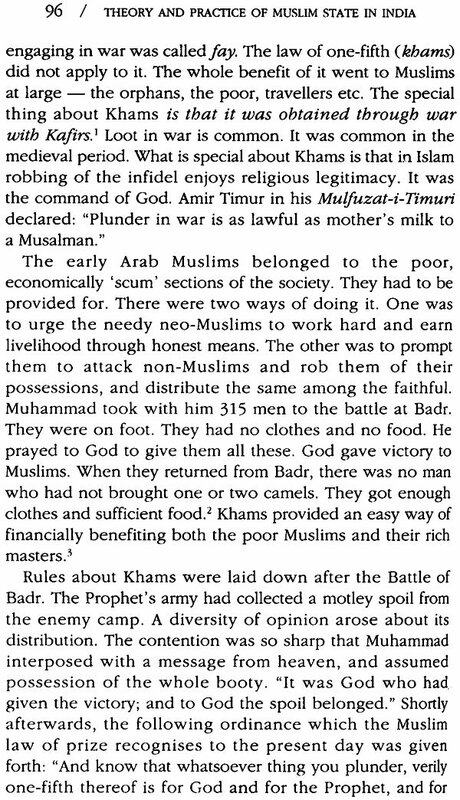 Such is the important place given to violence in Islam that when there are no non-Muslims to fight, the Muslims call one another Kafir and fight Jihad. Consequently, all over the world Jihadic terrorism seems to be a major Muslim activity even today, whether it is carried on in Muslim or non-Muslim majority countries. Hence the importance of both the theory and practice in the study of Muslim state in India. The theory part is traced to the Quran, the Hadis and the Sunnah or the Biographies of the Prophet; the Practice part to the principal activities of Muslim rulers in India as narrated by their chroniclers. The Quran of course is all important in Islam. But no less important is the Hadis. One is complementary to the other. The Biographies of the Prophet are equally important. In the Urdu preface (ibtidaia) of Sahih Muslim's translation by Maulana Wahid-uz-Zaman, Bashir Ahmad Naumani says that there are six authentic collections of Hadis - Bukhari, Muslim, Nasai, Abu Daud, Tirmizi and Ibn Majah. Urdu translations of these, together with the original text in Arabic, have been published by Aitqad Publishing House, Delhi. Mr. Sita Ram Goel was good enough to lend them to me for study. He also made available to me the Holy Quran's Urdu and Hindi translations with Arabic text published from Rampur. Thus I have been able to consult the most authentic translations of Islamic scriptures done by Muslims themselves and not by Western scholars who are sometimes accused of interpreting Muslim scriptures with a bias. And I do not speak myself, but let the Muslims speak, giving extensive quotations from their classical authors. The most accepted biography of Prophet Muhammad is by Ibn Ishaq. Its English translation has gone through many reprints in Pakistan alone. The Life of Mahomet written by William Muir and Mohammed and the Rise of Islam by D.S. Margoliouth are equally authentic. These are based on primary source materials including Hadis and I find that the accusation of these authors being prejudiced is not correct. 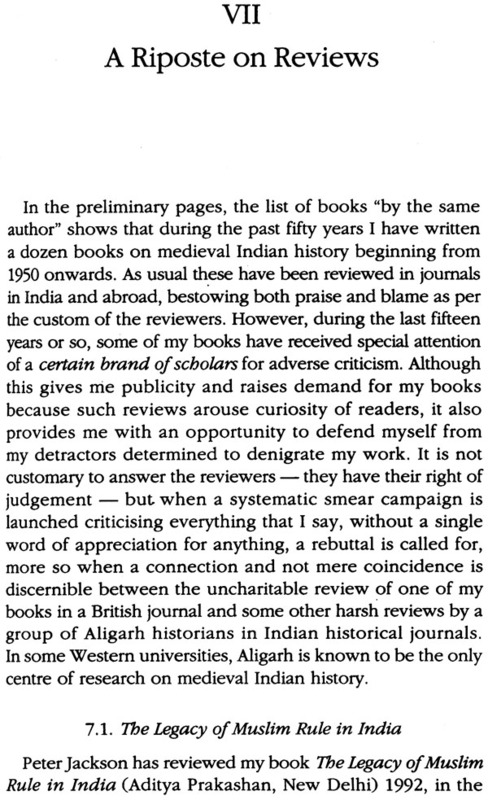 So far as evaluation of medieval Muslim chronicles is concerned, it has been done by me earlier in most of my books. There is no need to repeat what has been written about them earlier. Also the present study covers only the overall polity of medieval India; it does not deal with the provincial or regional Muslim States like Bengal, Malwa, Gujarat, the Bahmani kingdom or Kashmir. However, wherever Muslim rule prevailed, the basic principles of governance were the same. 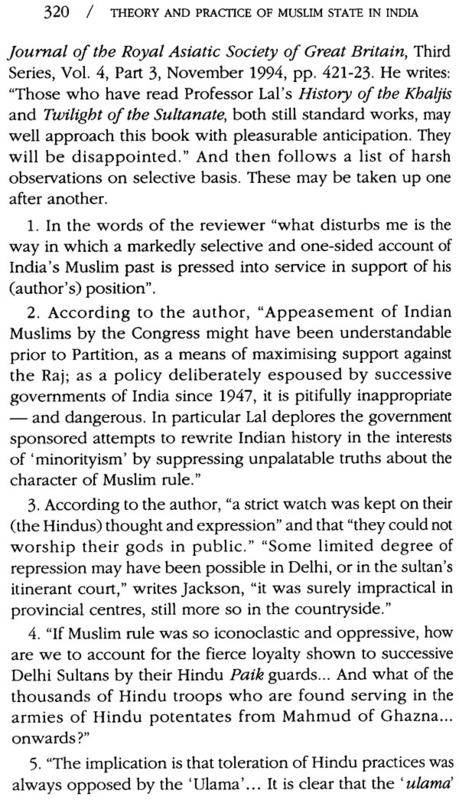 In short, 'Muslim State in India' represents the theory and practice of all states in India ruled by Muslims. This book has three parts. 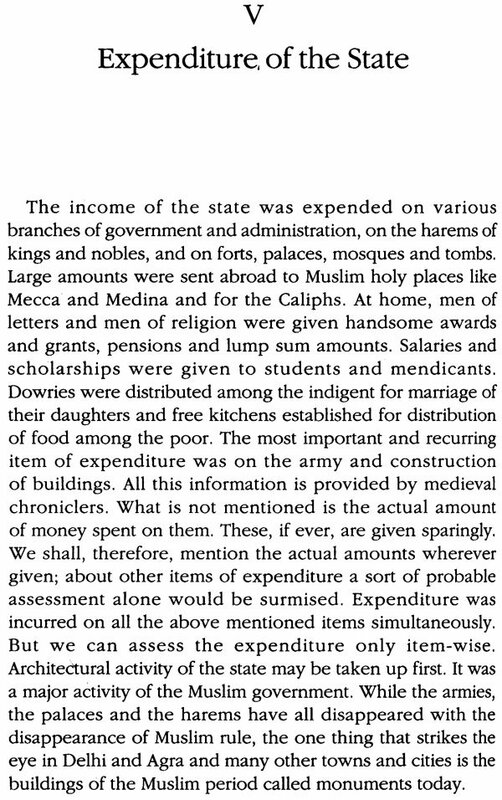 Part I deals with the Muslim state in medieval India, its obligations, its income and expenditure, its Jihad, its justice in historical perspectives. 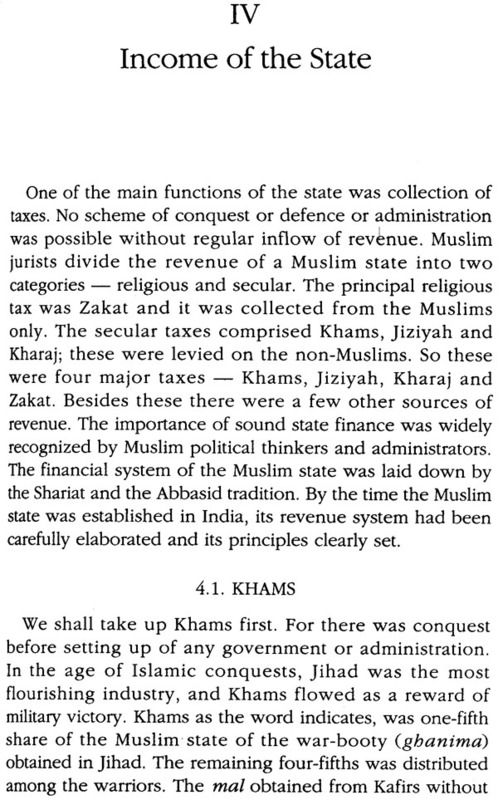 Part 11 is entitted Politics, for Muslim state in India has not ceased to exist even in modern times and Indian Muslims on account of Islamic laws and separate identity almost form a separate state within the Indian State. Part III is a Reposte on reviews of some of my books, carrying reiteration of some of my statements which have been challenged only with a motive to challenge. Professor R.P. 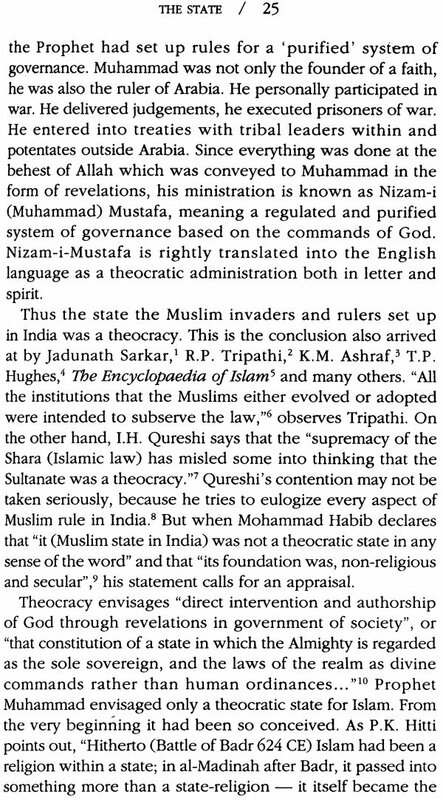 Tripathi begins his famous monograph entitled Some Aspects of Muslim Administration, by writing that the Muslim "invaders gradually wormed themselves into the heart of India, and finally assumed the role of the earlier Hindu Empire-builders like Chandra Gupta, Samudra Gupta and even Harsha ... The Muslim Sultan, however, differed from the earlier Hindu sovereigns in two respects. 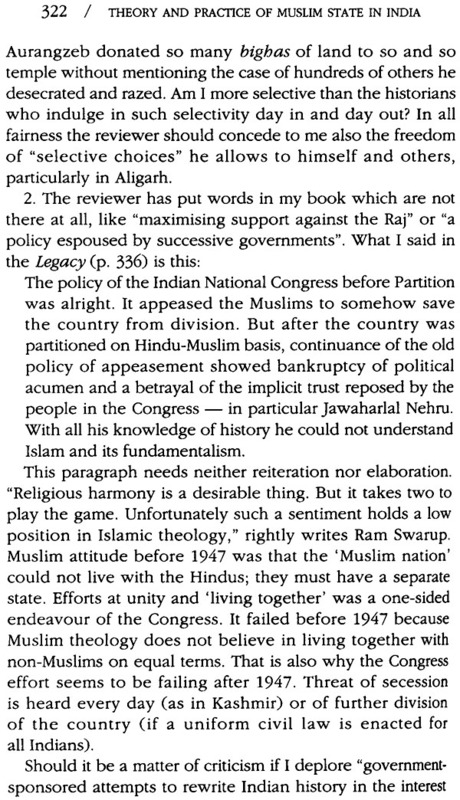 He did not belong to the country over which he had come to rule ... Secondly, he believed in a religion whose outlook on social and political questions was very different from that of the Hindus. He did not come ... simply for conquest. With him he had brought a well-defined religion, a highly developed civilization, and a set of institutions to which he clung with all his faith. Indeed, it was an avowed principle with him to maintain their purity and to establish them in lands under his sway." This statement of R.P. Tripathi lays stress on the following points: that Muslim invaders assumed the role of earlier Hindu empire-builders like Chandra Gupta, Samudra Gupta and Harshavardhan; that they did not belong to the country over which they had come to rule; that they believed in a religion which was very different from that of the Hindus; and that the invaders and rulers had not come just to' conquer but also to establish Islamic religion and institutions in all their purity in this country. We shall elaborate on these points to give an idea of what the present work is all about. It has been correctly said that the Muslim invaders and rulers did not belong to Hindustan. Muhammad Ghauri, Iltutmish and Balban ruled with the help of Muslim soldiers from abroad. 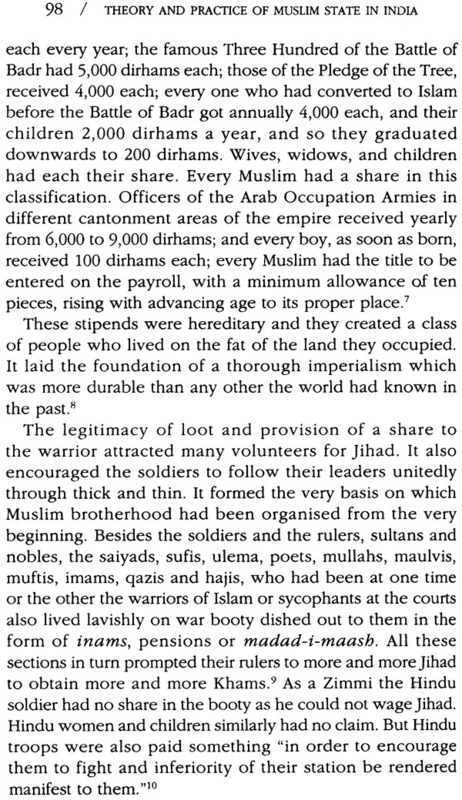 The Khaljis and Tughlaqs may be considered Indian, but they also regularly recruited warriors from outside India for extending their dominions and spreading Islam in India. 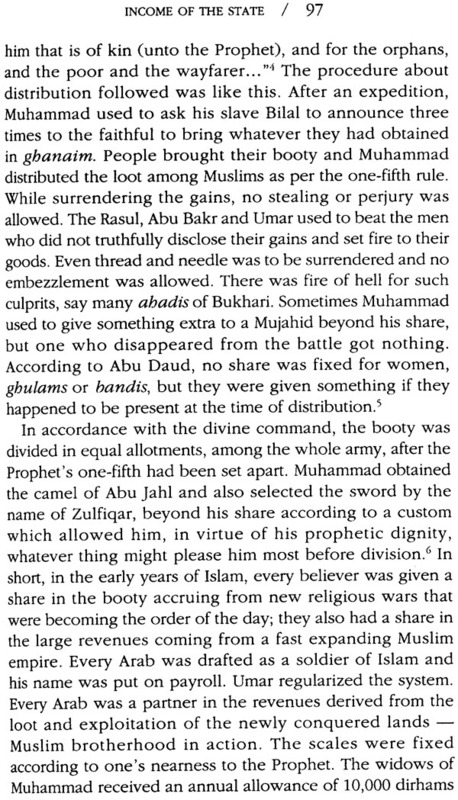 Many Muslim rulers depended upon the caliphs of Baghdad or Cairo for moral support. The Mughal invader Babur did not belong to India. He was forced by circumstances to march into Hindustan. His officers and soldiers disliked the country and clamoured to return home to Afghanistan. Babur himself had no love for the country and as per his wishes his body was taken and buried in his homeland. Akbar and Jahangir were regarded as Indians but not the other Mughals. 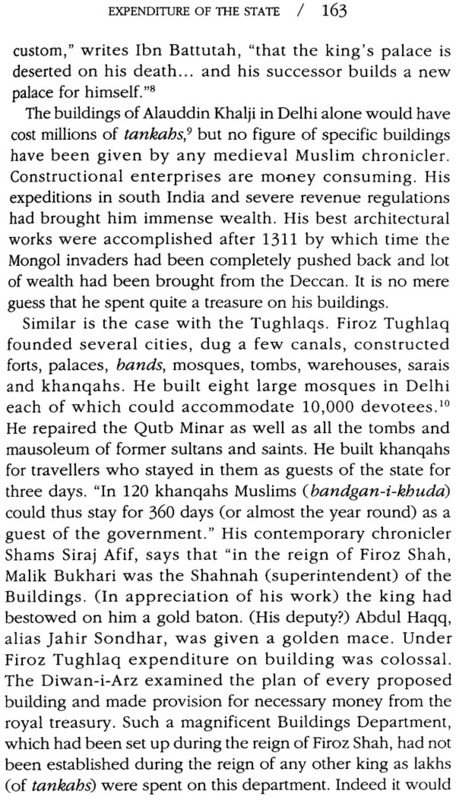 As late as the seventeenth century the French physician Francois Bernier while on a visit to India asserted that "the Great Mogol is a foreigner in Hindustan, a descendent of Tamerlane, chief of those Mogols from Tartary who, about the year 1401, overran and conquered the Indies, consequently he finds himself in a hostile country, or nearly so ... "
These alien rulers could not assume the role of earlier Hindu emperors. Although they gradually wormed themselves into the heart of India and built up large empires, they could not rule like Chandra Gupta, Samudra Gupta or Harshavardhan, The two belonged to two different religious streams. The Muslim sultans reigned according to the dictates of the Shariat, the Hindu emperors on the principles of Dharmashastra. Their rules of war and governance were poles apart. The Quran does not permit the existence or continuance of other faiths and their religious practices. Of the 6236 ayats in the Quran about 3,900 are directly or indirectly related to Kafirs, Mushriks, Munkirs, Munafiqs or non-believers in Allah and his Prophet. Broadly speaking these 3,900 ayats fall into two categories - those relating to Muslims who for their faith will be rewarded in this as well as the world hereafter, and those relating to Kafirs or non- believers who are to be punished in this world and are destined to go to Hell after death. The Quran reads like a manual of war on mankind rather than a charter of brotherhood for all mankind. 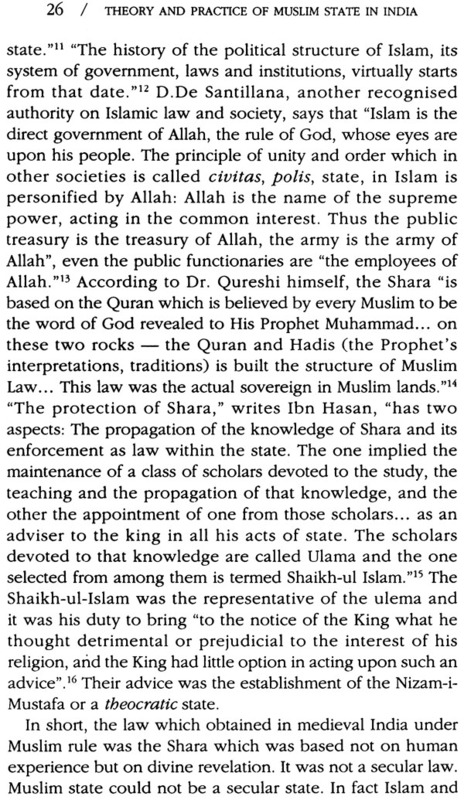 For people of other faiths, Jihad or permanent war was the command of the Quran and order of the day. Islam recommends Jihad or perpetual war on adherents of other religions - to lay hold of them, bind them, strike off their heads and burn them in the fire of hell. This makes Islam a totalitarian and terrorist cult which it has remained ever since its birth. On the other hand, Indian kings waged wars according to humane rules which have been elaborately described in the Dharmasutras and Dharmashastras, the Ramayana and Mahabharata, and the Arthashastra treatises of Kautilya, Kamandaka, and Shukra. Even during the medieval period, as has been observed by K.M. Munshi: "Whatever the provocation, the shrine, the Brahman and the cow were sacrosanct .... War being a special privilege of the martial classes; harassment of the civilian population during military operations was considered a serious lapse from the code of honour. The high regard which all Kshatriyas had for the chastity of women, also ruled out abduction as an incident of war." Moreover, never in this country was a war psychology developed for aggressive ends. The whole nation was never trained for purposes of war. Only one caste - the Kshatriya - was set aside for purposes of defence against foreign invasions and protection of life and property from internal dissensions. It is another matter that against the no-holds- barred jihadists, all castes, all sections of Hindu society joined to fight the invaders and proselytizers, but fighting was the duty primarily of the Kshatriya. In war and in peace, the Muslim rulers of Hindustan followed, as far as lay in their power, the injunctions of the Quran and the Hadis, the Shariat and the Sunnah. They had no knowledge of the scriptures and institutions followed by Chandra Gupta, Samudra Gupta or Harshavardhan. They could not and did not rule like Hindu kings. It is often said that all religions are alike. People may follow different paths but they all lead to the same God. If that were so, there was no need of any quarrel among peoples of different faiths. But strife among followers of different creeds is common. Therefore all religions are not similar. It is the fundamental teachings of a creed that mould the character and determine the conduct of its followers. Therefore it has been rightly pointed out by Tripathi that Muslim invaders and rulers believed in "a religion whose outlook on social and political questions was very different from that of the Hindus". The growing awareness that Muslim religion and Muslim rule were impositions and that Indians belonged to a different religious and political tradition, has not escaped Hindu consciousness of medieval history. It does not accept the Ilbaris, the Khaljis, the Tughlaqs, the Bahmanis, the Sharqis, the Lodis and the Mughals as indigenous dynasties on par with the Mauryas, the Guptas, the Cholas, the Pandyas, the Sangamas, the Marathas, the Sikhs, and the Jats. Its heroes are Prithviraj Chauhan, Vikram Pandya of Madura, Harihar and Bukka and Krishnadevaraya of Vijayanagar, Maharanas Kumbha, Sanga and Pratap, Maharajas Shivaji and Ranjit Singh and not Muhammad Ghauri, Alauddin Khalji, Sikandar Lodi or even Shahjahan. It was the erudite Alberuni who, after describing the atrocities inflicted by Sabuktigin and Mahmud of Ghazni, declared that "the antagonism between them (the Hindus) and all foreigners receives more and more nourishment both from political and religious sources". 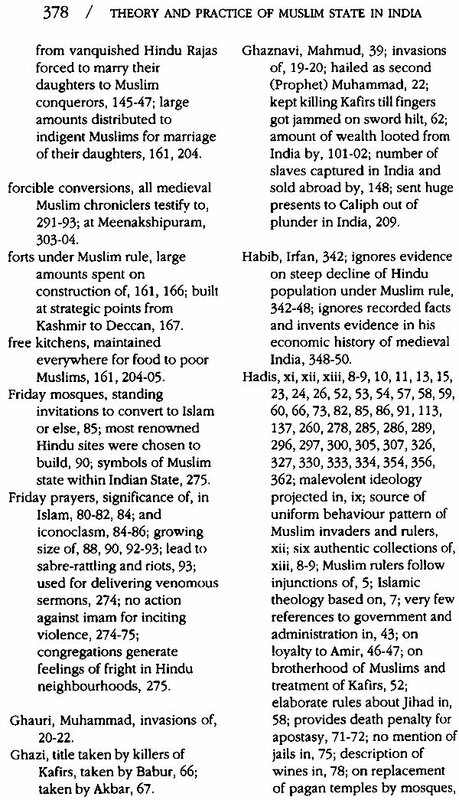 Muslim invaders and rulers, had come not only to conquer but also to impose the Islamic religion. And the gulf created by the phenomenon has not been bridged. For, Islam is an imposition on India. Worse, it has been imposed through conquest. Ralph Borsodi, an American educationist and social thinker, in his The Challenge of Asia observes that "everywhere in the world except in Asia Minor, the three great Semitic religions -Judaism, Christianity and Islam - are intruders; that indigenous Asia is Brahmanist, Confucianist, Buddhist, Taoist; indigenous Europe is pagan, that in Europe, Christianity is a superimposition; in Asia, Islam is."? 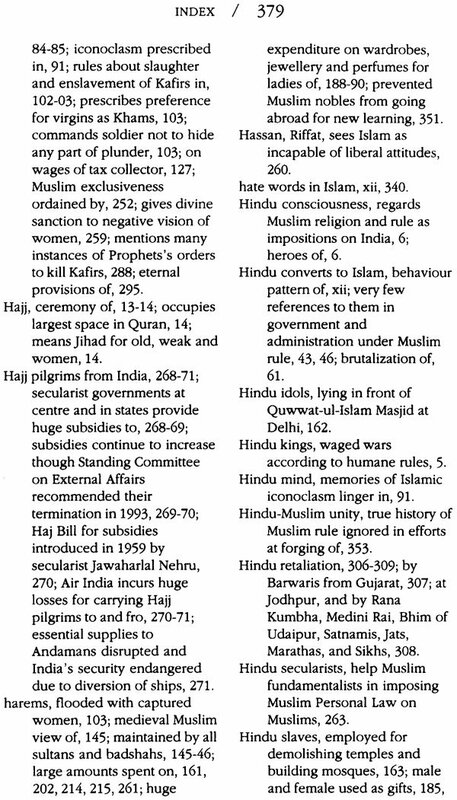 The achievements of Muslim conquerors and rulers in India consist of the pursuit of their political and religious policy of superimposing Islam on India. This is clearly borne out by the writings of medieval Muslim chroniclers like Hasan Nizami, Minhaj Siraj, Ziyauddin Barani, Shams Siraj Afif, Farishtah, etc. It is by going through their works that one can appreciate the spirit of how Islam was made to spread in India. As against the modern apologists, they take pride in the fact that Islam spread in India through the sword and through methods laid down in Quran and Hadis.